Heart Shaped Foods - All Day Long! Make everything heart shaped, especially the food, all day long! Giving chocolate hearts on Valentines Day is a time honored tradition, but why stop with chocolate? 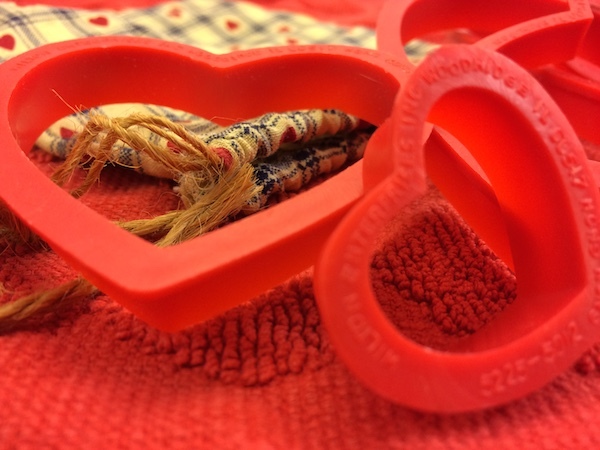 So many foods can be turned into hearts, with or without the use of cookie cutters. We’ll show a few ideas for alternate heart happenings, enough to keep the Valentine theme going all day long. Here are a few ideas to get started planning a heartfelt Valentines Day. Use a knife to spread softened butter that was left out on the counter into heart shaped chocolate molds and then pop them into a freezer for a few minutes so that they will pop right out onto a plate. Shape some biscuits or scones with your hands into heart shapes before cooking. 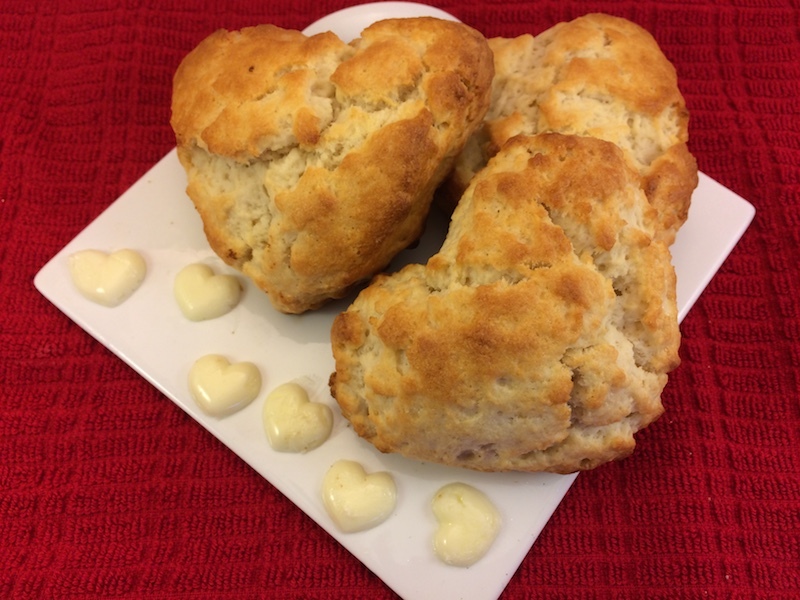 Here we used our easy homemade scones recipe and after a gentle kneading inside the bowl shaped them into large hearts and then placed them on a greased baking sheet to bake. A little strawberry jam when serving will add that touch of red needed to complete the dish. Use tiny heart cookie cutters to cut large marshmallows into little hearts to float in a nice mug of hot chocolate. Even if they’re beyond the best by date, they will soften in the hot liquid. Use a turkey baster or condiment squeeze bottle to design free-form heart shaped pancakes onto a flat skillet. Squirt some canned whipped cream into a heart shape on top of coffee instead of using coffee creamer. 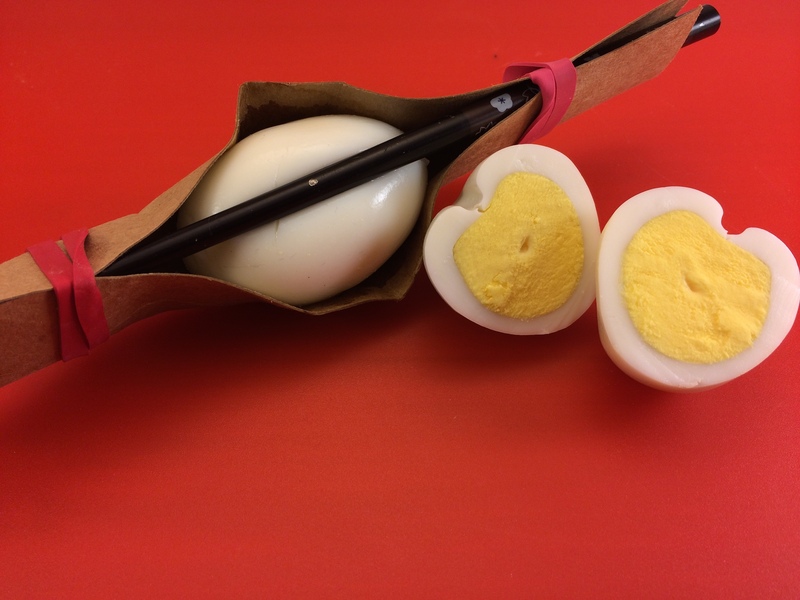 Add heart to your hard boiled eggs by making them into heart shapes using a chopstick and rubber bands to wrap them and make heart-shaped boiled eggs while they are still slightly warm. Then win the admiration of whoever consumes them. Make a heart shaped pizza. Many pizza places and take-and-bake stores serve them on Valentines Day, but here are the detailed instructions for how to make one at home from either homemade or purchased pizza dough. Heart shaped sandwiches will really impress the kids because they are crustless! Simply take a heart shaped cookie cutter to each piece of sliced bread before making your favorite sandwich, whether fresh or grilled. Note: Be sure to make use of the cut-off bread scraps by making bread pudding, french toast, croutons, breadcrumbs and more. Actually, take it a step further if you have a tiny heart cookie cutter and turn the larger scraps into heart shaped croutons and the smaller ones into breadcrumbs.! Whatever dessert you’re making, make it red and make it heart shaped. If you bought some red decorating icing at the Christmas clearance, go to town on your cupcakes and cookies. Red velvet cupcakes made in heart shapes make a decadent presentation. 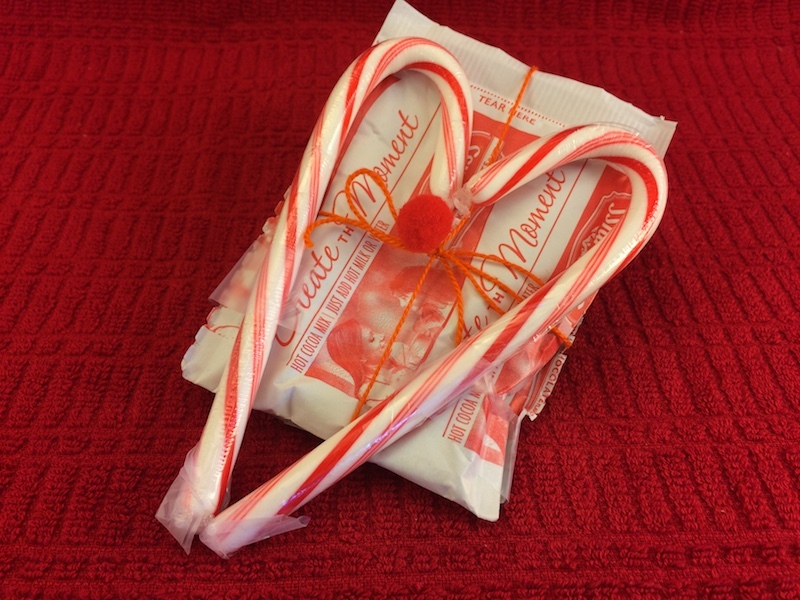 If candy canes are left over from the Christmas tree, face two opposite each other and turn them into a Valentines heart treat. Tape or glue a package of instant hot chocolate behind them and the recipient can make a special treat and stir it with the giver in mind. After all, peppermint hot chocolate is not reserved just for December – it can clearly still warm the heart in February! Strawberries, if cut vertically, will resemble hearts. Use a paring knife to remove the stems of large strawberries in a V shaped cut and then stand the strawberry on this cut and then slice it in half, or even into slices if desired. Fill champagne glasses with some bubbly and then send two of these strawberry hearts into the bottom of each glass to toast the end to this truly heartfelt day! Remember to keep any leftover champagne fresh.